Beyond high school, 90% of ISA students persist to the third semester in college, as compared to the national rate for all students of 77% and the national average for African Americans and Latinos of 55%. Click to enlarge. 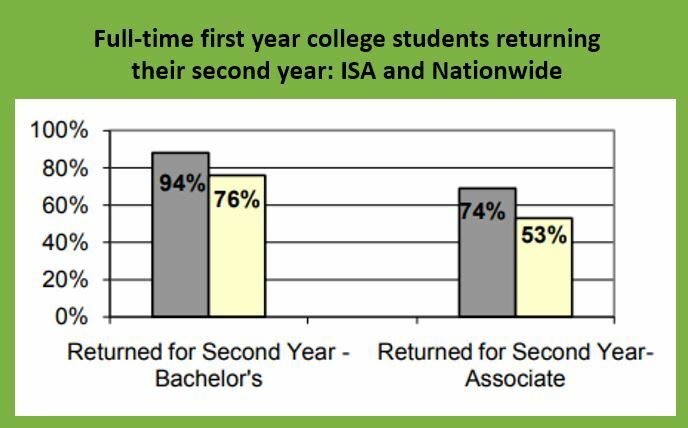 After 4 years in college, 81% of ISA students are graduated or still enrolled. ISA students have a higher average 4-year attendance rate than that of comparison peers. ISA students were 1.5 times more likely than comparison students to meet the 90% minimum attendance standard in 9th and 10th grade. 12th graders in ISA schools attended, on average, 3.5 more days per year than 12th graders in comparison schools. ISA students were more than 5 times as likely to be promoted to 10th & 11th grades than their peers. ISA students were also more than 3 times as likely to be promoted to 12th grade. When it comes to credit accumulation, ISA students earned, on average, 6.3 more credits in 4 years than did their comparison peers. Studies show that ISA’s largely African American and Latino student population has a 4-year cohort graduation rate of nearly 80%. This dramatically exceeds the national high school graduation rate for African American students of 60% and Latino students of 58%. Click to enlarge.